The Moesko Island Historical Society hold on open house at the island's historic lighthouse yesterday to celebrate the completion of five years of restoration work that rescued the once-rundown landmark from ruin. For more than a century, the lighthouse saved the lives of many a sailor by guiding ships away from its peech on hazardous Becke's Point and toward the safety of Moesko Harbor. Then, in 1969, the lighthouse was replaced by a new generation of beacons, a fully automated style warning light. The original contractor went against instructions and damaged the large granite boulder selected for the lighthouse base with unauthorised blasting. As a result the lighthouse was repositioned by several feet Due to continued tardiness and difficulties the contractor eventual gave up the contract and in 1880 a new tender given to a second contractor. By then a temporary light setup earlier had been in operation about a year. The tower is constructed of locally hewn interlocking granite blocks which were quarried on the island. It is fitted with a bronze handrail. In 1986, as part of preparation for demanning, the original apparatus, including the lens was removed and replaced by a lightweight array of sealed beams. When removed, the old lens and lantern was erected in the Museum at Moesko Island which is now displayed in a short 5 metre tower. A coin-operated mechanism operates on a slot coin principle. This switches on the light, the lens rotation and the operation of the original beam from the lens. The whole township of Moesko pertipated in the expenses concerned. Since 1881, visitors have landed here to inspect the Island's renowned Lighthouse and enjoy a tour of this scenic area which boasts colonies of seals and fairy penguins. 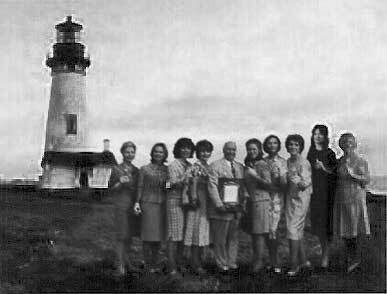 During the keepers' era all household and lighthouse stores had to be brought in by sea. The supplies were then brought up from the jetty to the lighthouse complex via a tramway.